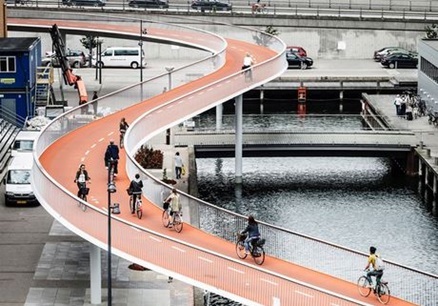 Copenhagen is the capital city of Denmark and has been named the World’s most bike-friendly city several times. This title has been won with good reason! Forty years ago, Copenhagen was just as full of cars as any other metropolitan city, but today it is famed for its massive network of more than one thousand kilometres of segregated bicycle tracks. These tracks allow more than sixty percent of the city’s 2 million+ residents to commute by bicycle on a weekly basis – that’s a lot of bikes. This sounds like a dream scenario for most cycling enthusiasts, but what is required to get such widespread adoption of cycling as a mode of transportation? Having lived in Copenhagen for the first 25 years of my life, I can attest that the infrastructure for cyclists really is second to none. Although infrastructure is undeniably a very important factor, this is not the only variable in creating a strong cycling culture. Below I have listed many of the reasons why Copenhagen is continuously crowned the number one cycling city on the planet. One of the biggest differences between Copenhagen and any larger Australian city is the way the transport infrastructure is set up. Copenhagen’s road infrastructure is purposely designed to massively decrease the likelihood of incidents between cars and bicycles by removing bicycles from the road altogether. 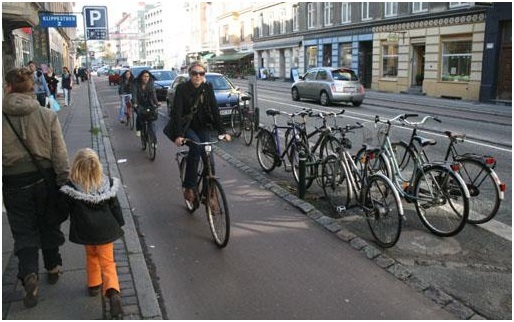 The image below shows a typical Copenhagen bike lane. It is completely separate from the road and is wide enough for two bikes to pass each other without any issues (the bike lane below is actually somewhat narrow compared to most bike lanes in Copenhagen). Just as importantly, the curb is wide enough that the risk of getting doored by someone exiting a parked car is small. Notice also how parked cars guard the bike lane from the main road, making it unlikely that someone will accidentally drive onto the bike lane. On this heavily trafficked street, the road has been narrowed from two lanes to one lane to make more space for cyclists. Image courtesy of copenhagenize.com. 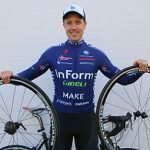 Are Danish cyclists better behaved than Australian cyclists? The (typical) image below would suggest not. In what looks like organised chaos, you will see three cyclists with music in their ears, and the guy in the middle in the brown leather jacket is texting while crossing a busy intersection. Generally speaking you’ll see people crossing red lights just as often in Copenhagen as in any Australian city, and many more people cycling while being on the phone or listening to music. As illustrated below, very few people use bike helmets. None of this sounds very safe at all, so how can it be so much safer to be a cyclist in Copenhagen? A typical morning in Copenhagen. Image courtesy of copenhagenize.com. Other than the obvious differences in infrastructure, a major contributor to a safe cycling environment is simple association between road users. That is, everyone in traffic is able to put themselves in the shoes of a cyclist. Almost every person in Denmark is a cyclist – including anyone who is also a motorist – which makes a big difference to the general attitude towards cyclists. Having an understanding and appreciation for what it’s like to be on a bicycle in traffic not only creates a different level of respect between motorists and cyclists, it also makes it a lot easier for motorists to predict how a cyclist might behave. Getting your driver’s license in Denmark is hard work and it involves many hours of theoretical and practical training. About a third of this training revolves around cyclists. In order to become a competent driver you must learn about the rights of cyclists in traffic, how to predict the (often illegal) behaviour of cyclists and develop a habit of always looking in your side mirror and over your shoulder when turning right (equivalent to a left turn in Australia) and when opening a car door. These habits are needed specifically to avoid turning and dooring accidents involving cyclists. 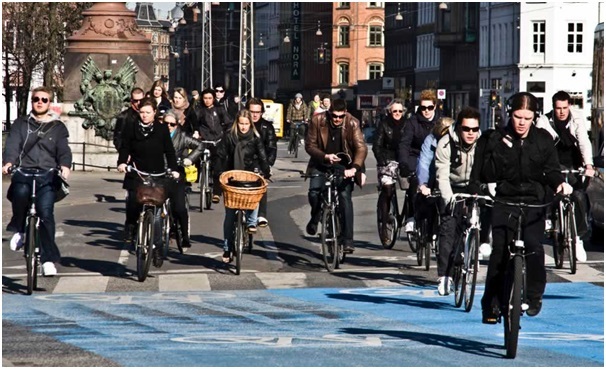 In Copenhagen, cycling is not a road race. You’ll see very few race bikes in traffic and people generally ride at lower speeds because of this. The race bikes and lycra outfits belong on the country roads, outside the city. The fact that the vast majority of cyclists are not wearing cycling-specific outfits makes a big difference in the general attitude towards cyclists. When a group of people look distinctly different from the rest of the population, “us and them” attitudes easily develop. Conversely, when a person on a bike is dressed just like any other person in traffic it is a lot easier to associate with them whether you are walking, cycling or driving a car. There is no doubt that the Danish authorities want people to ride bikes. Besides supplying a huge network of bike paths, the government also uses other measures to encourage people to get on their bikes. Bike helmets are not required by law and are rarely worn by adults, making life a lot easier for those worried about “helmet hair”. With registration taxes on new motor vehicles being a whopping 150 percent and petrol taxes of about 70 cents per litre, it is no wonder cycling is the most popular mode of transportation. Could we do the same in Australia? What would it require for Australian cities to get to a similar level of bicycle adoption? Becoming a true cycling city requires many years of investment in infrastructure and education of cyclists and motorists. Copenhagen has spent decades building its cycling infrastructure but also put a big emphasis on changing the attitude towards the cycling population very early in the process. In order to create widespread appreciation for what it means to be a cyclist in traffic, authorities have focused on two key areas: learner drivers and children participating in traffic for the first time. As mentioned earlier, learner drivers spend hours learning how to read and navigate around cyclists, and since 1942, eleven and twelve-year-olds have been getting their “cycling license” in a nationwide program organised by schools and police. The program includes class training, homework, a written exam and a riding test in traffic. By the time someone gets their first driver’s license they really understand and appreciate what it’s like to be a cyclist. To make the trip from A to B a bit nicer, some local governments have installed little welfare items such as this sloped bin and bike path footrests. Images courtesy of copenhagenize.com.